Disability Rights Wisconsin honors the life and legacy of Gwen Jackson, as we mourn her passing. Gwen served as the President of the Disability Rights Wisconsin Board; serving on the DRW Board from 1998 to 2003. Jackson passed away March 20th at the age of 90, after a lifetime of activism and service. 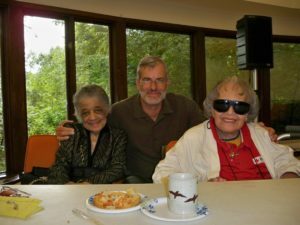 At DRW, we remember Gwen as a champion for the disability rights movement, a tireless leader, and a dear friend who loved to laugh and celebrate. Her connection with DRW remained long after her board service. She is shown here with then DRW Executive Director Lynn Breedlove, and her good friend and fellow activist Vel Phillips, after giving a rousing call to action to DRW staff from across the state. Our heartfelt sympathies go out to her family, as well as our gratitude for this beloved champion for social justice.